If you like a chicken in every pot, then the presentation of the terrific Robert Penn Warren novel in film form, "All the King's Men" might be the ticket. Playing late Wednesday, January 23, 2018 it has amazing performances by stalwarts like Broderick Crawford [Helen Broderick's little boy!] and Mercedes McCambridge, with assistance from John Ireland, Joanne Dru [did they meet on this film?] and a cast of excellent support. Some in the review section might quibble about this being a pastiche of Huey Long, as if it was to follow an exact replica of his life, but the point is well made about what happens when a despot takes over and sways people with his banter. Robert Rossen ably directed this masterpiece. A later film, with a similar theme might be Andy Griffith in "A Face in the Crowd". I might have to record FOOTLIGHT PARADE because it's one of my favorite musicals and has some great numbers. Jimmy Cagney gets to dance and "Shanghai Lil" is already starting to play in my head (again). TROUBLE IN PARADISE is sublime. Great cast, great set design, script and direction. A real delight. Precode, too. No, they were spooning (and forking, too, I bet - sorry, couldn't resist) while making Red River. That's why Howard Hawks cut Ireland's part down, because he had designs on Joanne himself. 7:15 a.m. Gold of the Seven Saints (1961). Is there good reason I’ve never even heard of this Clint Walker, Roger Moore film? Cagney was a really great dancer. We are simpatico on TROUBLE IN PARADISE. But- forgiveness- I can't stand ALL THE KING'S MEN. In the Dept. of Coincidences, CLUNY BROWN (1946) is encoring at 2:45 pm today. Good thing Bogart told Hawks to back-off or we wouldn't have many of those Bogart and Bacall scenes in To Have and Have Not. Hawks had 'designs' on Bacall from the start and the original screenplay had Steve\Harry going after the gal of the French freedom fighter. PS: what a nice way to phase things by using 'designs'! Tonight, or early Thursday morning in some places: Comanche Station is another enjoyable western from the excellent team of Randolph Scott, Budd Boetticher (director), and Burt Kennedy (writer). Thursday evening Joshua Logan's Fanny will be on view. I want to check out the Minnelli remake of The Four Horsemen of the Apocalypse, though it does not have a very good reputation. El Norte will be on in a few hours. It looks interesting and is a TCM premiere too. 8 p.m. Lord of the Flies (1963). Peter Brook’s impressive version of the William Goulding classic. About 12 years ago I saw a documentary on the BBC in which Peter Brook interviewed his now grown up cast of Lord of the Flies and discussed the making of the film. I haven't been able to find any reference to it on the imdb and it isn't in any dvd extras as far as I can tell. It was interesting to see the boys grown up but Brooks' thesis seemed to be that his cast had the same same characteristics as of the boys he had them play in the film. The very lighthearted Tom Chapin was having none of that. i would love to find a copy of it. Love all those films you mention, Christine particularly TIP! A great cast, with Hopkins, Francis and Marshall, and also has a bit part as a party attendee with Stanhope Wheatcroft, who is as ubiquitous in films then as Bess Flowers or the perennial drunken man, Jack Norton. What a name too for an actor! And...directed by Lubitsch, who always manages to rend somewhat salacious circumstances in such a charming and witty way that they are still resonant but not tawdry. I always have to also watch Marshall walk to see if I can detect his wooden leg. Cagney dancing often looks like a wooden puppet on a string, and I mean that as a compliment too! Lorna, Sorry to learn you don't like ALL THE KING'S MEN. I like it very much and find it still relevant. It's a cautionary tale. CaveGirl. Thanks for your post. You can be sure Marshall had a double run up and down those stairs. 11:45 p.m. The Wild Bunch (1969). To think when this was released in Ontario it had 13 minutes cut from the print and it was still restricted to those over 18 years of age. Synopsis: a 12 year old, going on 13, leaving the safety and security of his home in Canada to live in the wild. It was based on the bestselling book of the same name by Jean Craighead George that became a sensation in 1959. Dir: James B. Clark Cast: Teddy Eccles , Theodore Bikel , Tudi Wiggins . ''A slender, honest study of a boy learning to be a man his own way." WHAT!?! I saw this at the show in Toronto in 1969. I want my money back! Bringing Up Baby. I know there are quite a few people on this board who dislike this film, but I love it. Libeled Lady. One of Jean Harlow's best and one of the best non-Thin Man William Powell and Myrna Loy films. This film was later remade as Easy to Wed with Esther Williams (in the Myrna Loy part), Lucille Ball (in the Jean Harlow part), Keenan Wynn (in the Spencer Tracy part) and Van Johnson (in the William Powell part). As much as I love Lucy and think she was the best part of the remake, I prefer the 1936 original, Libeled Lady. My personal favorite film of the day is Gidget. I like Sandra Dee and I love teen beach movies. While I know Dee likes James Darren, aka Moondoggie, and spends much of the film pretending to be into the Kahuna (Cliff Robertson), why does she even waste her time? Moondoggie is much cuter than Kahuna, and he sings! I'm recording D.O.A tomorrow night which is airing after "The Essentials" which is featuring White Heat. 10 a.m. Tomorrow Is Another Day (1951). The premise of this Ruth Roman, Steve Cochran film sounds promising. Ozploitation fans aren't going to want to miss Razorback playing on @TCMUnderground tonight at 2:30am. Like Jaws, but with a giant killer pig. Razorback was rather stylish for its day. The director, Russell Mulcahy, had done a number of music videos, and his killer pig movie has some of that mid-80's MTV look. His next film was the cult hit Highlander. American star Gregory Harrison was trying to break into movies after a lengthy run on TV's Trapper John MD. Bogie, I've seen this film and liked it very much. Noir fans should check it out. 6:30 p.m. Bad For Each Other (1954). I’ve never seen this early Chuck Heston film. 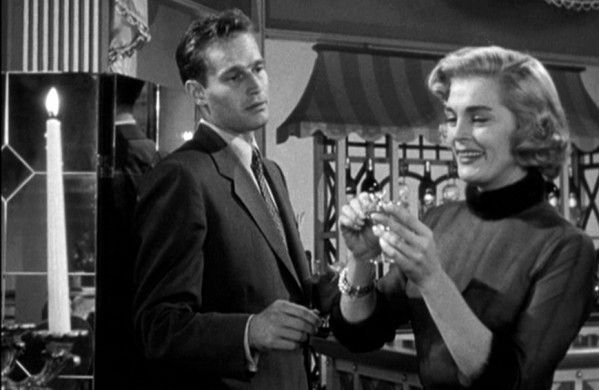 With Lizabeth Scott. In 20 minutes Chaplin's A Woman of Paris is on. A good film he directed without his little tramp character in it. After that is In Vanda's Room - a Portuguese documentary on heroin users. 1:45 a.m. North by Northwest (1959). I saw this last October on the big screen and you have to admit, it is darned good. 9:15 AM, Mon., Jan 29. Kill the Umpire. A really good baseball comedy with William Bendix. I have this on one of those bad girls DVD sets. It's OK, but not among the best for Heston or Scott.